Alice Paul was born on January 11, 1885, in Moorestown, New Jersey, the daughter of William M. Paul, banker and businessman, and his wife, Tacie Perry. Alice, the eldest of four daughters in this Quaker family, was educated at Moorestown Friends School before earning her undergraduate education at Swarthmore College in 1905. After working for a time on New York City’s lower east side as a social work intern, assisting in the organization of women workers, Alice Paul did graduate work at the University of Pennsylvania. After earning her master’s degree in sociology from Penn in 1907, Paul spent three years in England where she studied economics and sociology at the Universities of London and Birmingham. While in England she was active in the Women’s Social and Political Union and was arrested and jailed repeatedly as a participant in the campaign for women’s rights led by Emmeline Pankhurst and her daughters, Christabel and Sylvia. After returning to America, Paul wrote her 1912 doctoral dissertation on the legal position of women in Pennsylvania. She later earned law degrees from Washington College and American University. Paul became an aggressive leader of the women’s movement in the United States. She was appointed chair of the Congressional Committee of the National American Woman Suffrage Association in 1912. In June 1916, Paul founded the National Woman’s Party, its sole plank a resolution calling for immediate passage of the federal amendment guaranteeing the enfranchisement of women. These activities led to strong political opposition and, in 1917, even imprisonment of Alice Paul and other N.W.P. women in the Occoquan Workhouse in Virginia. When the women went on a hunger strike, they were force fed. Paul was subjected to psychiatric evaluation, but the examining psychiatrist pronounced her sane, describing her as willing to die for her cause and never giving up. After the women’s situation was publicized, the public outcry and official outcome contributed to President Woodrow Wilson’s 1918 announcement of support for the women’s suffrage amendment. After the amendment was passed by Congress and then ratified by the states in 1920, Paul and other feminist leaders moved on to work for women’s rights in other areas. In 1923, the National Woman’s Party introduced an Equal Rights Amendment to Congress, authored by Alice Paul. Her political activism never ceased. In 1938 Paul founded the World Woman’s Party in Geneva, Switzerland. After World War II the World Woman’s Party lobbied successfully for the inclusion of equality provisions in the United Nations charter. And in the 1960’s Alice Paul linked women’s rights to the black struggle for civil rights and worked hard for the E.R.A. Paul died in Moorestown, New Jersey on July 9, 1977. 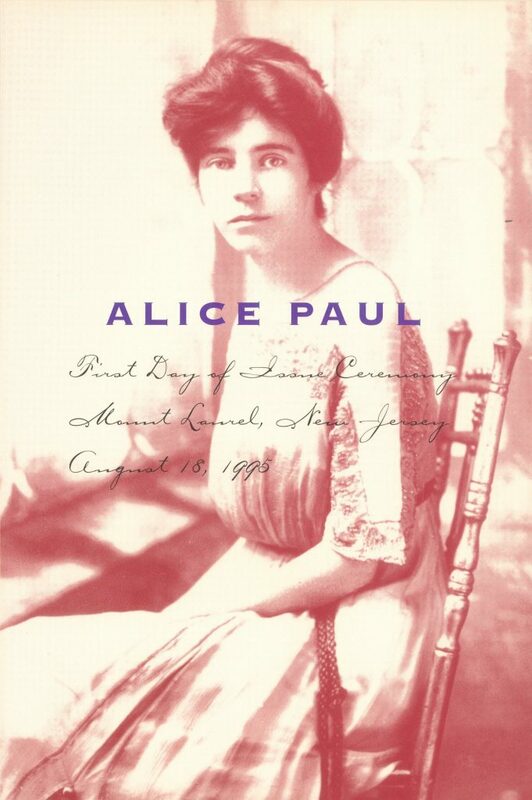 A United States postage stamp honoring Alice Paul was issued on August 18, 1995.